Fifty years ago, the United States founded the United Nations, promoted the Universal Declaration of Human Rights, used economic aid as a tool for creating stability, and viewed collective agreements and cooperation as the principal methods of sharing the costs and the risks of security. Today, under the leadership of George W. Bush, the main tool of foreign policy is military force, not diplomacy. America is going it alone, and paying the price, both abroad and at home, for the reckless endangerment of both national and international security. 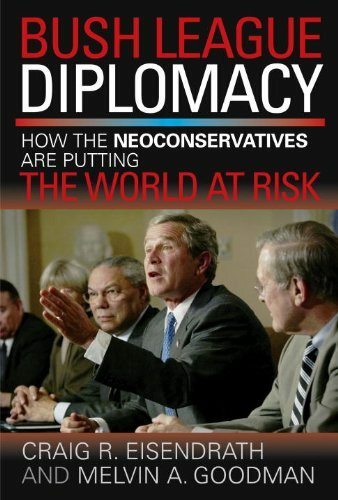 In this comprehensive critique of the Bush administration’s handling of international relations, Craig R. Eisendrath and Melvin A. Goodman, both senior fellows at the Center for International Policy, demonstrate the folly and the dangers of abandoning diplomacy and relying on military force as the chief means of conducting U.S. foreign policy. The authors argue that a policy of bullying will sow seeds of resentment and mistrust among our potential allies and encourage nations hostile to our interests to seek nuclear and other weapons of mass destruction as a last-resort method of protecting themselves against a belligerent world power. Eisendrath and Goodman foresee the international community becoming dangerously unstable, not more secure, under a Pax Americana maintained by military might. On the domestic front, the authors warn that a policy emphasizing the power of the executive branch at the expense of Congress, and suspending long-standing civil rights under the pretext of national security, threatens the Constitution. Finally, the decline of government services for education, health, and the elderly, and the economic effect of huge military expenditures financed by deficit spending are already causing distress in large parts of our society. This trenchant critique by two experienced foreign policy analysts will serve as a wake-up call to the dangerous militarism at the heart of the Bush agenda. A former CIA official (Goodman) and ex-diplomat (Eisendrath) team up to examine how, in their opinion, the Bush administration has rolled back over half a century of foreign policy accomplishments. Current policy relies on bullying with military force, they argue, as it rejects the broad collaborative approach in effect from the founding of the U.N. to the first President Bush’s coalition against Saddam Hussein in the Gulf War. Although Eisendrath and Goodman see some potential for change in recent administrative appointments, they emphatically urge that more direct action toward multilateralism must be taken to restore America’s reputation abroad and counter the centralization of power in the presidency to prevent deterioration of the domestic situation. Craig Eisendrath (Philadelphia, PA), a former diplomat, is a senior fellow at the Center for International Policy in Washington, D.C.; an adjunct professor at Temple University; the author (with Melvin A. Goodman and Gerald E. Marsh) of The Phantom Defense: America’s Pursuit of the Star Wars Illusion, among other books; and the editor of National Insecurity: U.S. Intelligence After the Cold War. Melvin A. Goodman (Washington, D.C.), a former CIA official, is a senior fellow at the Center for International Policy, a professor of international security at the National War College, an adjunct professor at Johns Hopkins University, and the author of several books on international relations, including Gorbachev’s Retreat: The Third World and The Wars of Eduard Shevardnadze.